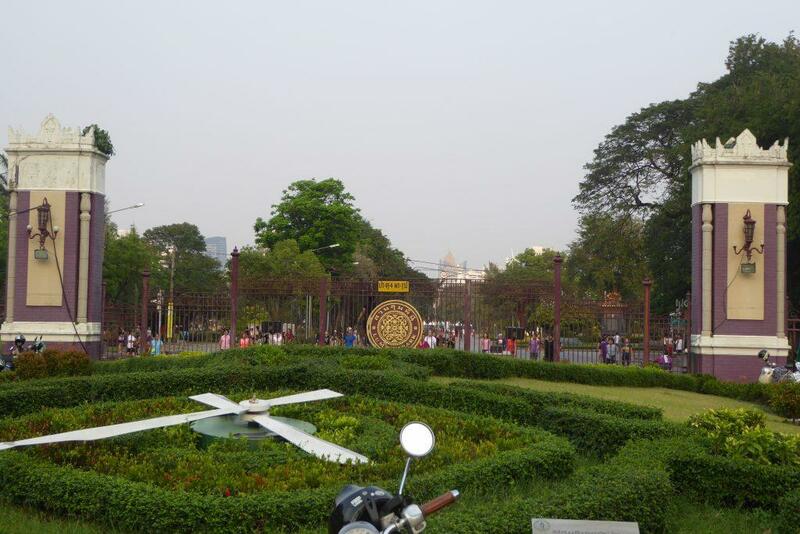 Lumphini Park in Bangkok’s is the green heart of the city. 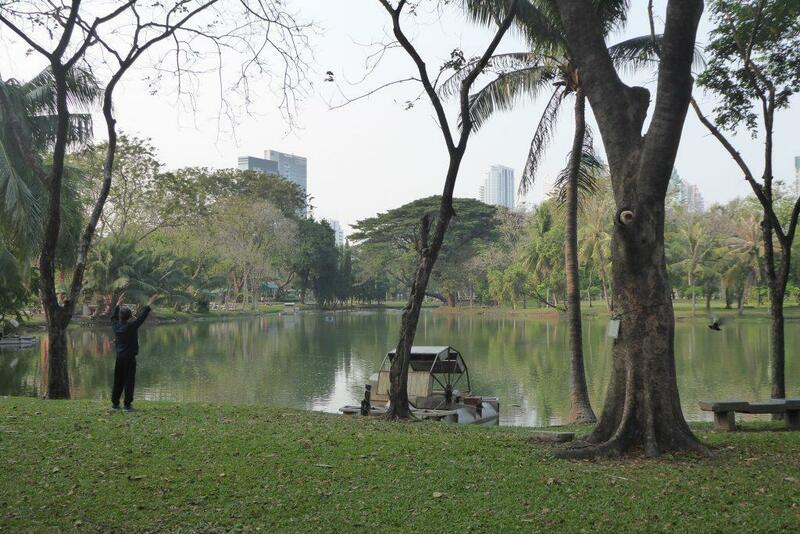 It’s the best park in Bangkok covering 142 acres of prime real estate in the heart of the city. 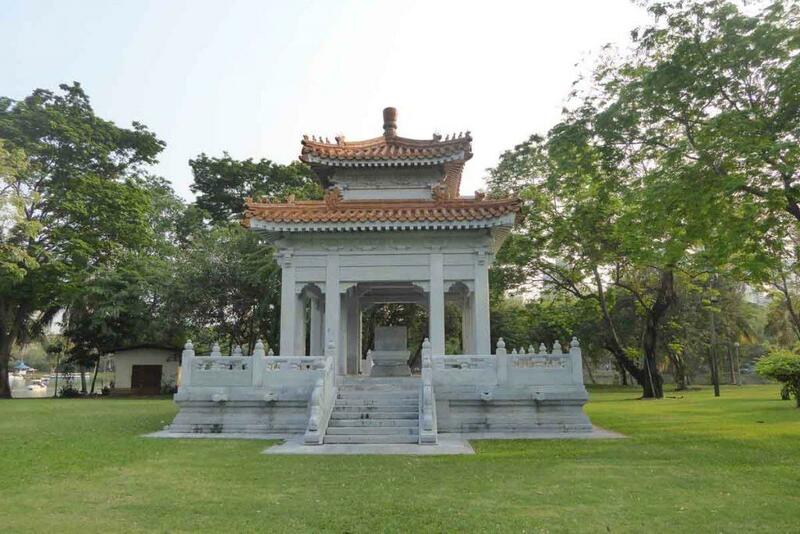 The parkland was royal property before it was donated to the city in the 1920s by King Rama VI for use by the people and developed into a public park. 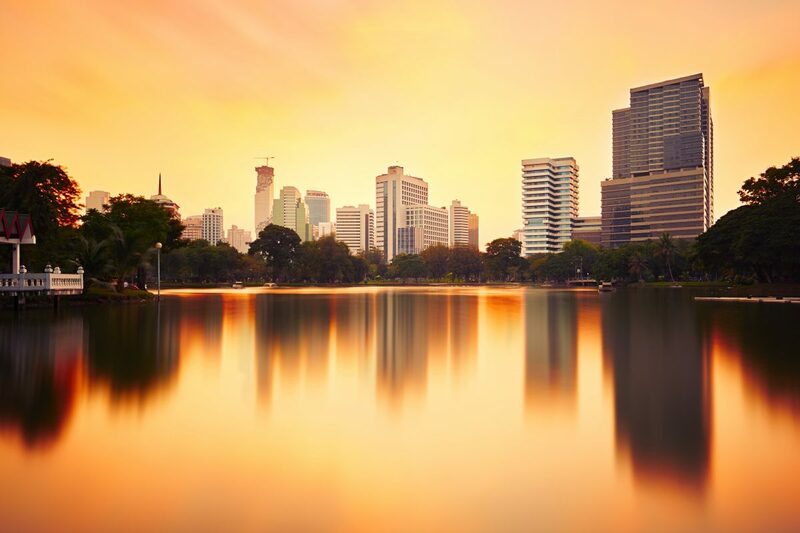 Named after the Buddha’s birthplace in Nepal, it’s surrounded by skyscrapers, embassies, upmarket condos and the five-star hotels of the Sathorn, Ratchadamri, Witthayu and Rama IV Roads. Home to unlimited fresh air and a multitude of healthy activities it’s a wonderful place to escape the heat and hustle and bustle of the city. 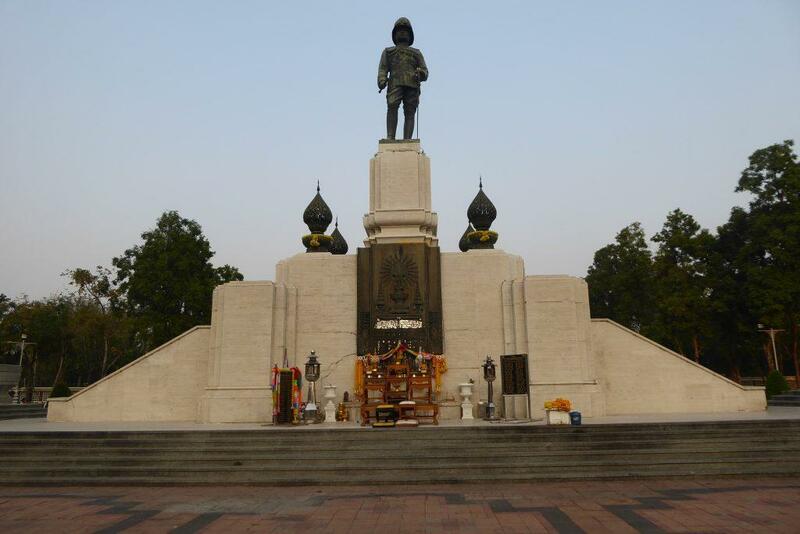 The main park gate is opposite the Silom – Ratchadamri – Rama IV intersection and has a standing statue of King Rama VI just outside the gate. 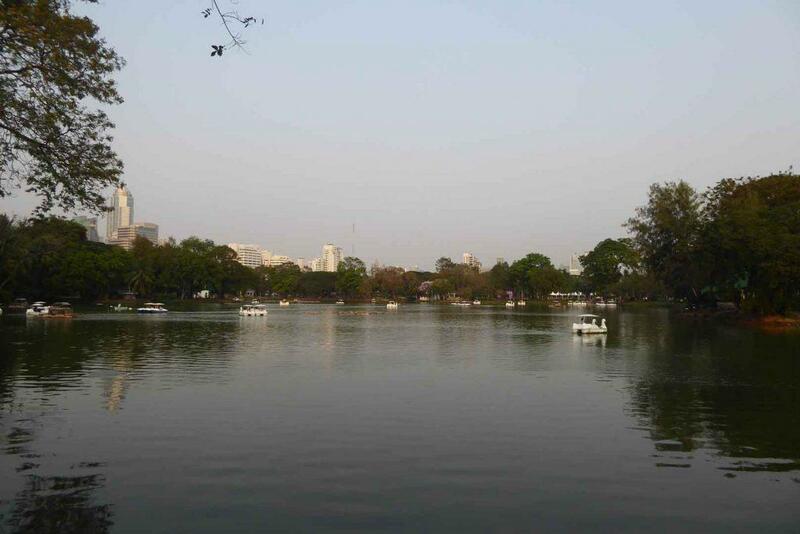 The park contains many trees, plants and flowers, kid’s playgrounds, fitness zones, a lake with pedal-boats, canals, a concert stage, sporting facilities, wide walking paths, food outlets, sculptures, some Chinese and Thai style pavilions, and visible wildlife. There is a range of healthy activities that are available inside the park. In the mornings, you will see people practicing Tai-chi and Yoga and groups of usually older men playing Chess on concrete chess tables in leafy seated areas. 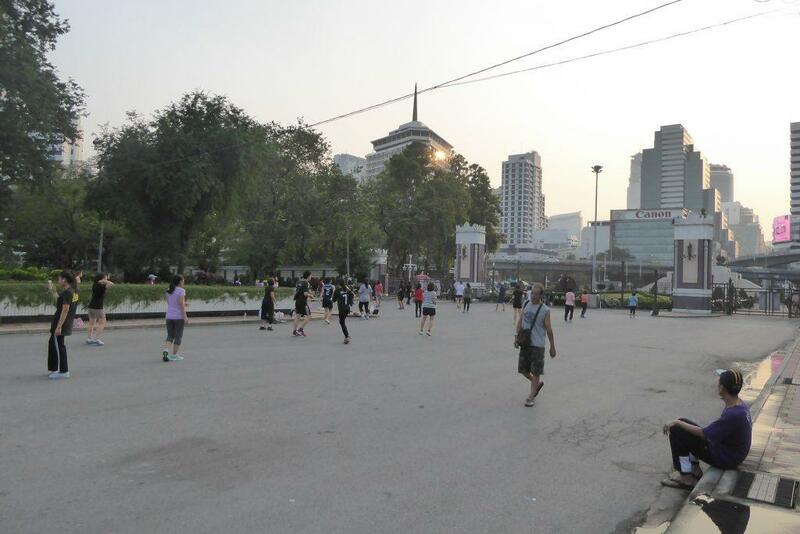 In the evenings, just inside the main entrance behind the Rama VI statue from around 18.00, there is a daily Aerobics session accompanied by loud amplified techno music. There is an air-conditioned fitness center in the Lumphini Youth Center which anyone can join by paying a 40-baht membership fee and showing ID card or passport. Sporting facilities at the center include tennis and badminton courts and an outdoor swimming pool. 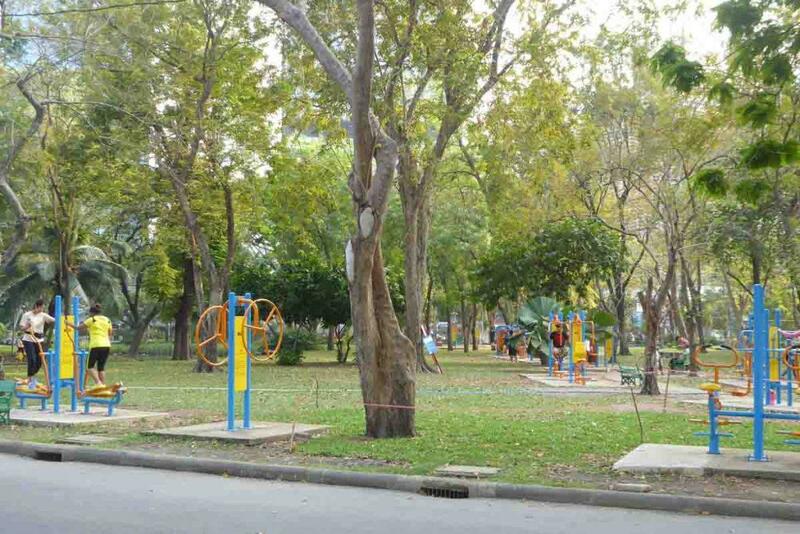 There is also some free to use open-air fitness equipment in several areas of the park as well as an open-air outdoor weights gym full of local muscle men. The park’s paths are popular with joggers especially in the early evening and a loop around the park is a 2.5km jog. Cycling is only allowed between10.00 and 15.00 when the park is less busy. Bicycles can not enter the park outside these hours. 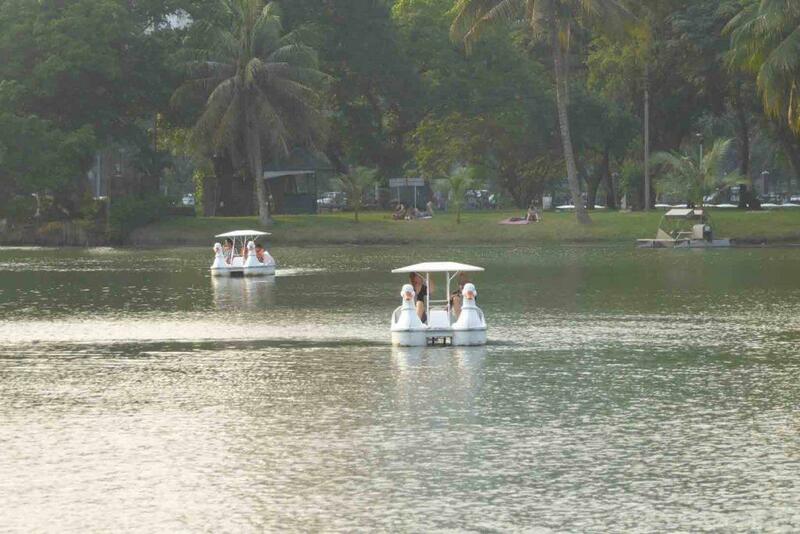 The two-seater, Swan pedal-boats can be rented at points around the lake for 40 baht per 30 minutes. A park wouldn’t be a park without some resident animals and Lumphini has plenty. 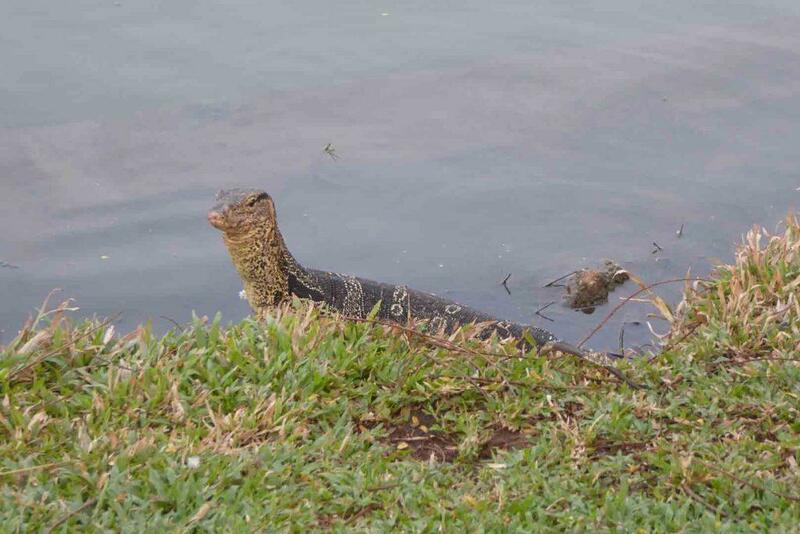 The most interesting is the monitor lizards or “Bangkok Crocodiles” who are a cross between a small crocodile and a mini-dinosaur. They can be seen swimming in the lake and canals or wandering around the park looking for food. They avoid humans so are not a danger though one fell out of a tree and landed on a Chinese tourist not so long ago prompting an annual cull to keep the numbers down. 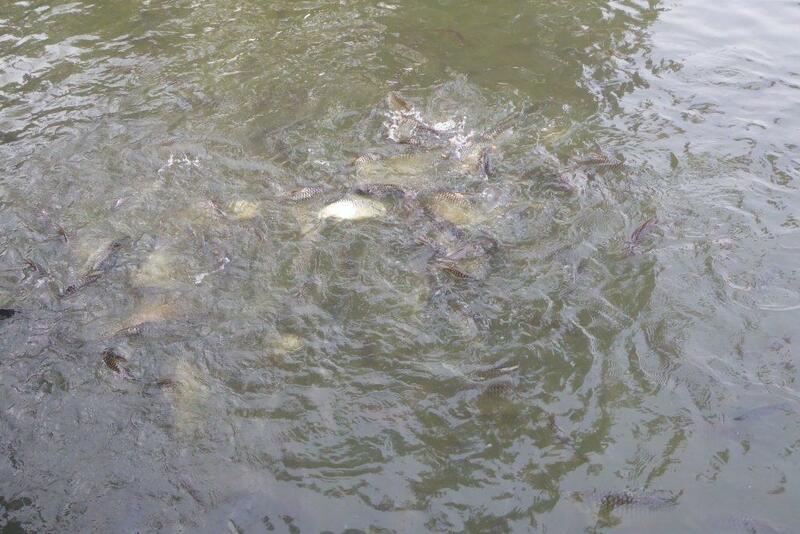 There are also turtles and many fish in the lake and canal. Vendors sell bread for you to feed them which usually results in a thrashing feeding frenzy. Many squirrels inhabit the park and will approach you hoping you have some nuts. The park is very popular for bird watching with over 30 species in residence. You can even take birdwatching lessons here. One thing to avoid is the red ants who have a nasty bite. Be careful if sitting on the grass. 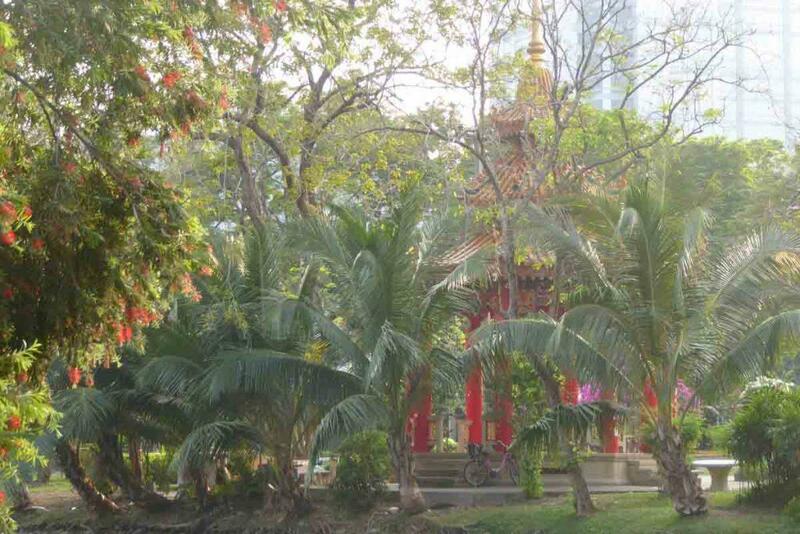 From December to February the Palm Garden of Lumphini Park becomes the site for the annual Concert in the Park. There are classical music concerts by the Bangkok Symphony Orchestra and other bands. Events are held every Sunday from late afternoon. There is food and drink stalls or you can bring your own picnic. Mats to lay on the grass can be hired for 30 baht. After 21.00 the park is best avoided as street prostitutes and dodgy characters hang around the parks exterior at night. 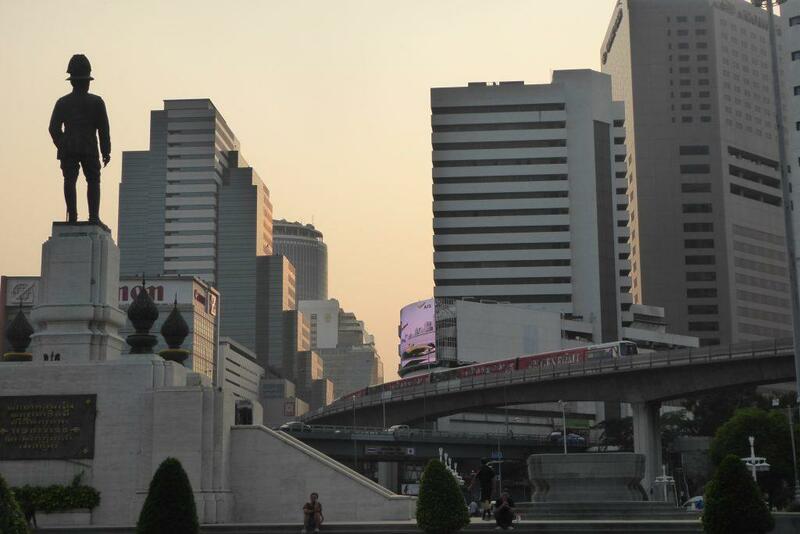 Location: Main entrance at the Silom – Ratchadamri – Rama IV intersection. 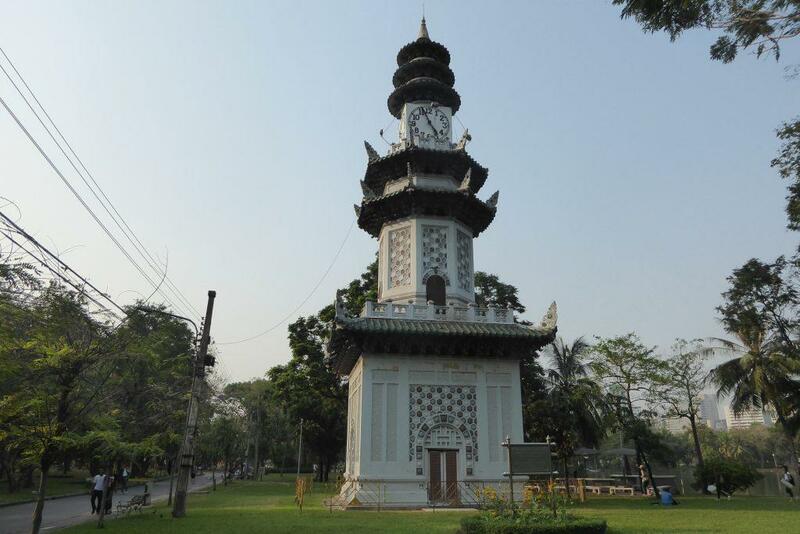 Other entrances on Witthayu Road, Rama IV Road, and Sarasin Road. Rules: No smoking. No dogs. Cycling permitted only between 10.00-15.00. BTS: Sala Daeng station or Ratchadamri station. Bus: No. 4, 13, 14, 15, 17, 22, 45, 46, 47, 50, 62, 67, 74, 76, 77, 89, 109, 115, 116, 141, 149, 164, 173, 505, 507, 514, and 544.